Pas Reform is an international company, which has specialized in the development of innovative hatchery technologies for the poultry sector since 1919. Efficient, space-saving workflow organisation with Pas Reform’s ergonomically designed in line sexing table. Designed to accommodate the feather, colour and cloaca/vent sexing of one day old chicks, Pas Reform’s in line sexing table provides good access and comfortable, efficient, adjustable working positions for up to 30 operators. The slow moving conveyor and slide system returns any unsexed chicks to the start point. Workstations are easily adjusted to left- or right-handed operation and include two trays for male and female sorting, a light fixture with socket outlet and adjustable droppings pot. Sexed chicks slide via chutes onto two parallel discharge belt conveyors located under the table for space saving and manoeuvrability. Slow moving conveyor and slide system moves chicks to end of table, with parallel return back to start-point for unsexed chicks to repeat the process. Chicks pass sideways. Included: Work stations for location on either long side of the table, easily adjusted for left- or right-handed sexers; Two parallel chick conveyors, one for male and one for female chicks, located under the table. 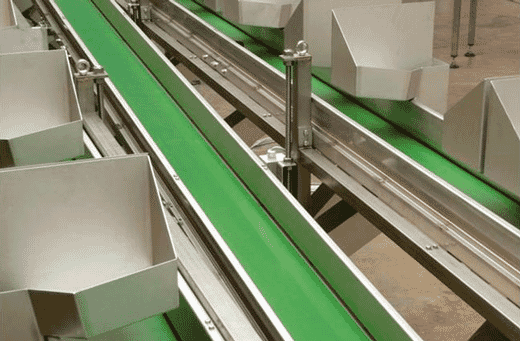 Chick conveyors connect to two take-off conveyors, where sexed day-olds pass to the next station in the automation process. Options: Individual counter for each sexer Seperate control belt for each sexer.